When I first started working here, there was already a barcode scanner that totally looks like an alien from the movie Alien. More scanners have been released since then, but none of them really looked like much of anything. Until today! 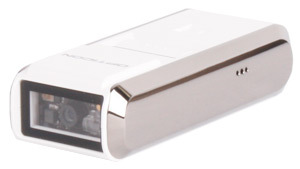 Datalogic has a new presentation scanner out, the Gryphon I GPS4400, using their Gryphon 2D scanner in a new design. 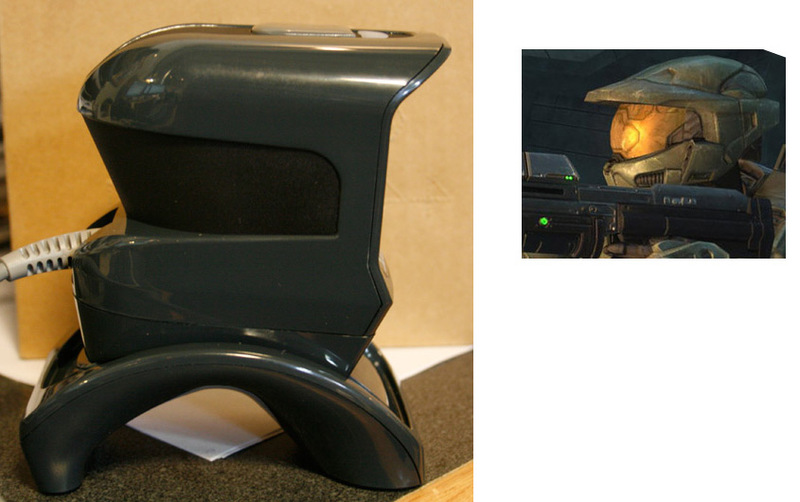 And it bears a pretty solid resemblance to Master Chief from the Halo series. It looks like Master Chief with a feeding or breathing tube or something. As for the scanner itself, the Gryphon I GPS4400 is a pretty sturdy device. It’s about the size of a softball if you need something for scale. But compared to other presentation scanners, it offers a little beefier scanning. Kind of like you have a handheld scanner in a presentation design. The scanner has a solid heft to it, so doesn’t feel like it’s going to get dragged off a counter from a heavy cable or anything. For retail barcodes, the GPS4400 can get reads from about a foot away. It’s definitely designed for “presenting” the barcode to the scanning window, as opposed to swiping it by like on an in-counter scanner. Datalogic’s Green Spot is up in there to give you visual cues of good scans. That kind of functionality is nice for places like libraries or music venues; places where the beep will be distracting or ambient noise is such that you wouldn’t hear it anyway. In terms of durability, the scanner is pretty set for retail use. Four-foot drops won’t really slow it down, so if it does get knocked off a counter no biggie. It also has an IP62 seal, meaning it’s sealed against any dust and the odd splash of water. I wouldn’t put this out in the rain, but if you’re prone to spills, it should be okay. The GPS4400 can be removed from the base if you want to like wall mount it or something. In that case it could be a good presentation scanner for a mobile ticketing or check-in application, like airplane boarding, for instance. All in all, the Datalogic Gryphon I GPS4400 is a smart 2D scanner at a good price. Man it’s fun to test out stuff before it’s available for public consumption. I feel fancy. Anyway, there’s a new Motorola scanner that was announced today, the DS4800, and I wanted to talk about it since that’s my job. The DS4800 is a fancy pants 2D area imager. And most likely pretty spendy. I don’t know for sure yet, there’s no MSRP listed. 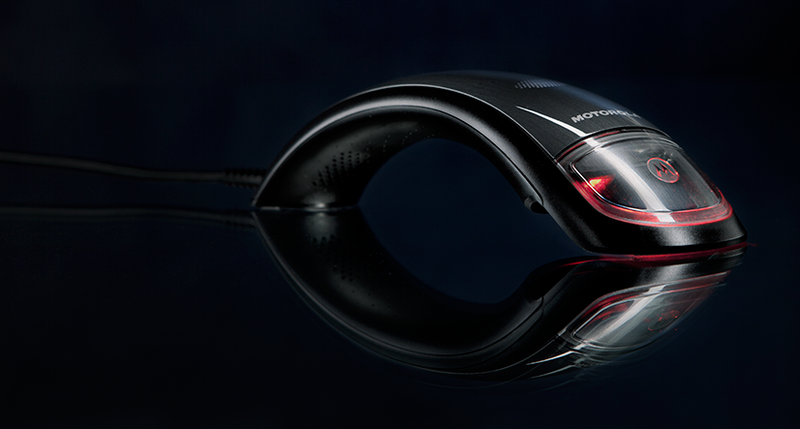 But check the lines on this thing, really sleek, really smooth. It looks like a fancy phone. I think we were calling it the batwing when we were messing around with it. For the trigger, instead of a button, the DS4800 uses a capacitive trigger system with haptic feedback, which is pretty fun to mess with. It cuts down on moving parts too, so it could be a little burly. But I don’t want to drop this thing at all. Oh and the sounds. That’s a whole thing there. So you know how scanners make a beep tone when they scan? It’s usually a chip that chirps one of a few tones? Well the DS4800 ditches that for a speaker and the ability to play audio files. The first time you’ll notice is on power up, when it plays a gravitas-filled crescendo. And then successful scans come with a nice tone. However, this means that with 123scan, you can switch the tones to be whatever you want. Clearly many audio clips have licensing fees associated with them, but imagine the Star Trek teleporter sound on powerup and phaser noises during scanning. It’d be awesome! I haven’t even gotten to performance yet. So it’s a 2D imager, it’s a bit different version than the Blockbuster they’ve been putting into their mobile computers and the DS6878 and DS9808. But it’s a great scan engine, with about a foot and a half depth of field on regular retail barcodes. The scanner can read off screens remarkably well, so mobile couponing or mobile ticketing would be no big deal. Options are available with driver’s license parsing, so you could see the DS4800 as a credit card signup scanner, or maybe in admitting in hospitals, or age verification in fancy bars. The possibilities are limitless. There are also customization options available at certain order thresholds. If you need a lot of scanners, like a whole lot, Motorola can customize your DS4800 fleet to match whatever you want. Want to slap your brand logo on it? They can do it! Want the scanner to shout “Woo hoo!” on successful scan right out of the box? Done and done. There are a ton of potentialities here, and it’s terrific. Once pricing is squared away, I’m sure these things will fly off the shelf. It’s very much a new era in data capture, and it’s great to see manufacturers shifting away from the same design that’s been in use for 20 some years. You can learn more about the scanner at Motorola as well. Hey so this is a new and weird development in point of sale. Epson has released a line of printers called OmniLink, which include a computer in the printer itself. Seems pretty crazy, but companies put TVs in refrigerators. 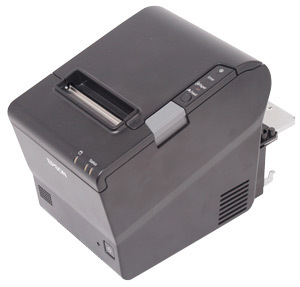 Anyway, the main product that we think will work for us and our customers is the Epson OmniLink TM-T88V-DT, which offers a full computing experience in a slightly taller receipt printer. It’s a great fit for smaller retailers, kiosks, or really any location where space is at a severe premium. Built with a TM-T88V, this comprinter (check that portmanteau out) has the top-tier printing needed for extended longevity and fantastic performance. The TM-T88 line has been the gold standard for printing for five revisions, and this model is no exception. A top print speed of nearly a foot per second keeps even giant receipts appearing as if from magic. The auto-cutter is rated for 2 million cuts and the printer has a MTBF of nearly 40 years of operation. This is a long-lasting printer. Beneath the printer is the POS computer underpinnings, an Atom processor running Windows POSReady 7. POSReady is a slimmed down version of Windows, eliminating unneeded features, like Solitaire, so it runs better on more energy-efficient hardware. 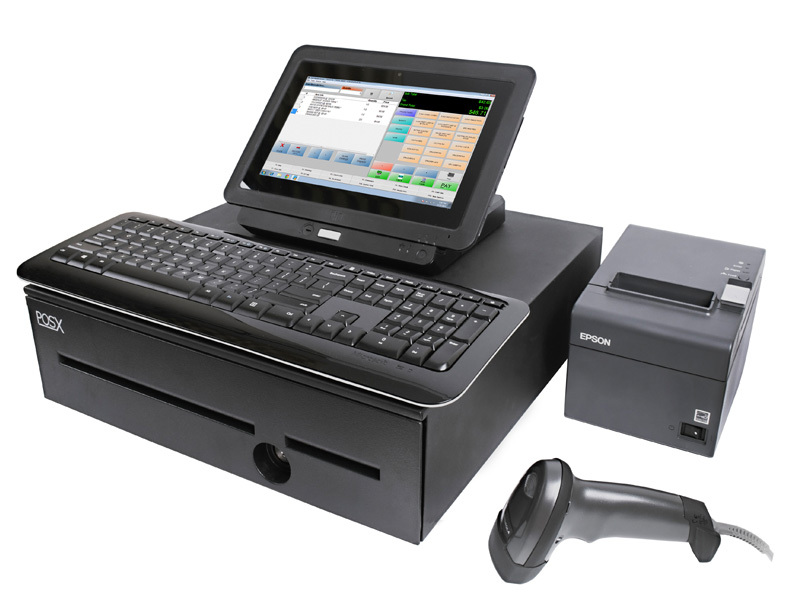 You get 4 GB of RAM and a 16 or 32 GB SSD, so you could run lightweight standalone POS software or have it setup as a secondary order station to a larger deployment. We even have a video up to show the ins and outs of the TM-T88V-DT. Check it out! There’s a growing class of barcode scanners hitting the market, companion scanners. These are cordless scanners that are small, don’t necessarily come with a charging/communications cradle, and are designed to communicate with mobile computers, tablets, and smartphones. The Opticon OPN3002i is a recently released companion scanner and should offer some fantastic 2D scanning at an affordable price. The OPN3002i is designed primarily for use with iPhones, iPads, Android devices, and any other Bluetooth-equipped consumer smartphone. It’s even white with chrome accents, like some familiar iOS devices. Configuration is really easy, you just have to scan a barcode to set it up in Serial Port Profile (SPP), HID, or MFi serial modes, then hold the scan button for a few seconds until it chirps. Then it can pair to whichever Bluetooth device you’re using. We prefer using HID mode over MFi or SPP, as it allows the OPN3002i to act like a keyboard and scan into any active text box. MFi and SPP act as virtual serial ports, so your software will need to be configured to take advantage of that type of connection to get a read. When a HID device connects to iPhones, the on-screen keyboard will hide until the connection is broken. This is difficult if you’re doing inventory management and want to add notes such as quantity or condition. Thankfully, hitting the secondary function button on the OPN3002i will bring the keyboard back up, a great addition to the scanner. In terms of performance, the OPN3002i is a pretty solid 2D imager. Regular retail barcodes can be read from about 8 inches away, so for registries or light inventory scanning, you should have an easy enough time getting a good read. The scanner can also read 2D barcodes, such as QR, PDF417, or Data Matrix. A popular option for cordless 2D scanners is for loyalty program sign-up. Since most driver’s licenses have PDF417 barcodes on them, you can scan the barcode and parse out the data you need, making it incredibly fast to sign customers up for loyalty programs, credit card applications, or admit them in healthcare environments. On the demo model we had, we did notice a lag when sending barcode data to the device, something very noticeable on larger 2D barcodes. data was entered at about the same speed as a competent typist, which is a bit slower than the fast blast of data we’re accustomed to with cabled scanners.For standard 1D barcode scanning, it’s really not noticeable, you may just see it if you decide to scan a driver’s license or shipping label. Opticon let us know that this is a bandwidth issue on HID mode and isn’t a problem when running in SPP or MFi modes. So if speed is key for your data entry, you may want to look into developing your software to communicate directly with the OPN3002i. All in all, the OPN3002i is a great 2D scanning option for small business or personal inventory management. Since it’s an area imager, you don’t have to properly orient the barcode for a good read, which can speed up the data capture process. Configuring and pairing the scanner is incredibly easy, and being able to enable the on screen keyboard is a prime feature. We even have a video of the OPN3002i in action, in case you want to get a feel for the size and capabilities of this great companion scanner. I talked about the Seiko Qaliber a couple months ago, but we also have a video review up to really show off the features and capabilities of Seiko’s new receipt printer. That glowing light by the auto cutter is just a great accent. And it can be changed to a couple other colors if you want to match your business’s aesthetic. We put together a quick look at the durability of the LI2208 barcode scanner, as a teaser for yesterday’s launch. Now that it’s launched, it seems like a good plan to share it with anyone who wants to check it out. We’ll have a more comprehensive video soon, but it’s great to see that if you hit products with bats and softballs and stomp on things at your work, this scanner will still work fine. I guess we did crack the housing a bit, but since the scanner is one single board, the scanning components are still working like a champ.